Baseball is “America’s National Pastime” – Why? Maybe it’s because it’s played by people like Scott H. Potter. Scott Potter played the game of baseball in the GM community as a youngster. Scott took a break from the game for a few years to explore other interests, but he longed to be back on the field. As a young teen, he again returned to the sport he loved. With great passion, in spite of his skills being behind his peers because of his hiatus, it did not diminish his love, his heart and his desire to work hard. Even through it was a challenge, he showed great determination, a true respect for the game, he was a great teammate, was coachable and demonstrated outstanding sportsmanship on and off the field. Scott loved the game, the grass, the dirt, his teammates, his coaches, the fans and yes, even, the umpires. He loved to practice and he loved to see his hard work pay off in a game. Baseball isn’t always an easy sport, but Scott had the balance needed and his passion carried him through. He also brought the fun to the game – win or lose, hit or strike, Scott was simply happy to be a part of it all. Sadly, Scott lost his life way too early. This award is named after him because Scott embodied why baseball is a wonderful sport and that tenacity and heart can make all the difference. Every baseball season each Coach will nominate one player from their team. Members of the baseball community and the GMJBA Board of Directors will review the nominations by Coaches and award the one player, during that season that stood out above the rest. All nominees will be recognized at their season-end meeting/event/party. All nominees will also be recognized at the Opening Day Ceremonies in April of following year, kicking off the upcoming season. 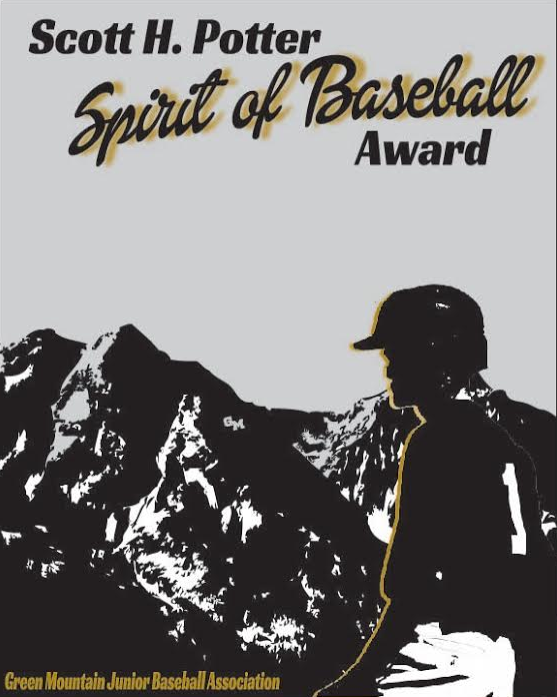 The Scott H. Potter Spirit of Baseball award will then presented to the final award winner. Information and Nomination forms can be found on the Documents tab on the left navigation of www.gmjba.org.